The TI-5024 is one of the early battery operated desktop printers sold by Texas Instruments. A similar model using a green VFD display instead the grey LCD display was introduced with the TI-5029. The next medium sized desktop calculator in the line was the TI-5032. The TI-5024 was manufactured by Zeny Corporation. 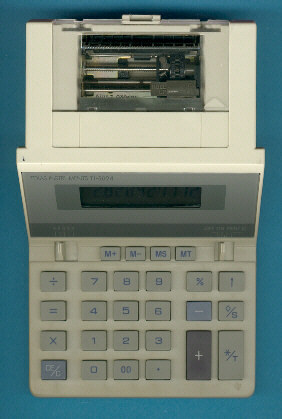 The TI-5024 is featured in the Texas Instruments Incorporated bulletin CL-908 dated 1986. © Joerg Woerner, July 3, 2002. No reprints without written permission.